For four years, Autism Society Philippines Cavite Chapters have held their annual Siblings Camp Philippines (SibsCamP), a two-day support-group activity where siblings of persons with autism come and meet together for a series of activities that will equip them with knowledge and understanding autism, as well as share their experiences with their brothers’ and sisters’ journey with autism. During the camp, the siblings engage in different group activities, and in the process, their relationships grow stronger, not only with their siblings with autism, but also with each other. 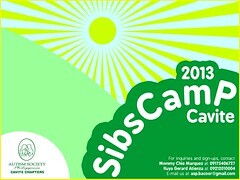 This year, as a way to end this year’s summer season, ASP Cavite Chapters will be having their 5th SibsCamP on 1-2 June 2013, and will be facilitated by Teacher My Sorongon.